"Don Bosco" redirects here. For other uses, see Don Bosco (disambiguation). For schools of that name, see Don Bosco School (disambiguation). "St John Bosco" redirects here. For colleges of that name, see St John Bosco College. John Bosco (Italian: Giovanni Melchiorre Bosco; 16 August 1815 – 31 January 1888), popularly known as Don Bosco [ˌdɔm ˈbɔsko], was an Italian Roman Catholic priest, educator and writer of the 19th century. While working in Turin, where the population suffered many of the ill-effects of industrialization and urbanization, he dedicated his life to the betterment and education of street children, juvenile delinquents, and other disadvantaged youth. He developed teaching methods based on love rather than punishment, a method that became known as the Salesian Preventive System. A follower of the spirituality and philosophy of Francis de Sales, Bosco was an ardent devotee of Mary, mother of Jesus, under the title Mary Help of Christians. He later dedicated his works to De Sales when he founded the Salesians of Don Bosco, based in Turin. Together with Maria Domenica Mazzarello, he founded the Institute of the Daughters of Mary Help of Christians, a religious congregation of nuns dedicated to the care and education of poor girls. He taught Dominic Savio, of whom he wrote a biography that helped the young boy be canonized. 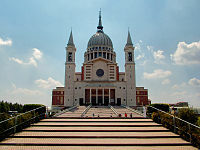 On 18 April 1869, one year after the construction of the Basilica of Mary Help of Christians in Turin, Don Bosco established the Association of Mary Help of Christians (ADMA) connecting it with commitments easily fulfilled by most common people, to the spirituality and the mission of the Salesian Congregation (CG 24 SDB, 1996, NR. 80). The ADMA was founded to promote the veneration of the Most Holy Sacrament and Mary Help of Christians (Don Bosco, Association of the Devotees of Mary Help of Christians, San Benigno can. 1890, page 33). In 1876 Bosco founded a movement of laity, the Association of Salesian Cooperators, with the same educational mission to the poor. In 1875, he began to publish the Salesian Bulletin. The Bulletin has remained in continuous publication, and is currently published in 50 different editions and 30 languages. Bosco established a network of organizations and centers to carry on his work. Following his beatification in 1929, he was canonized as a saint in the Roman Catholic Church by Pope Pius XI in 1934. John Bosco was born in the evening of 16 August 1815 in the hillside hamlet of Becchi, Italy. He was the youngest son of Francesco Bosco (1784–1817) and Margherita Occhiena. He had two older brothers, Antonio, and Giuseppe (1813–1862). The Boscos of Becchi were farmhands of the Moglian Family. John Bosco was born into a time of great shortage and famine in the Piedmontese countryside, following the devastation wrought by the Napoleonic wars and drought in 1817. When he was little more than two years old his father Francesco died, leaving the support of three boys to his mother, Margherita. She played a strong role in Bosco's formation and personality, and was an early supporter of her son's ideals. In 1825, when he was nine, Bosco had the first of a series of dreams which would play an influential role in his outlook and work. This first dream "left a profound impression on him for the rest of his life", according to his own memoirs. Bosco apparently saw a multitude of very poor boys who play and blaspheme, and a man, who "appeared, nobly attired, with a manly and imposing bearing". The man said to him: "You will have to win these friends of yours not with blows, but with gentleness and kindness. So begin right now to show them that sin is ugly and virtue beautiful." John Bosco since he was ten years old at the festive oratory, he started watching his classmates attitude and in every fight he was the referee. The older boys were scared of him because John Bosco knew their strengths and their weaknesses. Poverty prevented any serious attempt at schooling. John's early years were spent as a shepherd, and he received his first instruction from a parish priest. His childhood experiences are thought to have inspired him to become a priest. At the time, being a priest was generally seen as a profession for the privileged classes, rather than farmers, although it was not unknown. Some biographers portray his older brother Antonio as the main obstacle for Bosco's ambition to study, as the brother protested that John was just "a farmer like us!" On a cold morning in February 1827, John left his home and went to look for work as a farm-servant. At 12, he found life at home unbearable because of the continuous quarrels with Antonio. Having to face life by himself at such a young age may have developed his later sympathies to help abandoned boys. After begging unsuccessfully for work, Bosco ended up at the wine farm of Louis Moglia. Although Bosco could pursue some studies by himself, he was not able to attend school for two more years. In 1830 he met Joseph Cafasso, a young priest who identified some natural talent and supported his first schooling. In 1835 Bosco entered the seminary at Chieri, next to the Church of the Immacolata Concezione. In 1841, after six years of study, he was ordained a priest on the eve of Trinity Sunday by Archbishop Franzoni of Turin. John Bosco was first called to be chaplain of the Rifugio ("Refuge"), a girls' boarding school founded in Turin by the Marchioness Giulia di Barolo. His other ministries included visiting prisoners, teaching catechism, and helping out at many country parishes. At that time, the city of Turin had a population of 117,000 inhabitants. It reflected the effects of industrialization and urbanization: numerous poor families lived in the slums of the city, having come from the countryside in search of a better life. In visiting the prisons, Don Bosco was disturbed to see so many boys from 12 to 18 years of age. He was determined to find a means to prevent them from ending up here. Because of population growth and migration to the city, Bosco found the traditional methods of parish ministry inefficient. He decided it was necessary to try another form of apostolate, and he began to meet the boys where they worked and gathered in shops and marketplaces. They were pavers, stone-cutters, masons, plasterers who came from far away places, he recalled in his brief Memoires. The Oratorio was not simply a charitable institution, and its activities were not limited to Sundays. For Don Bosco, it became his permanent occupation. He looked for jobs for the unemployed. Some of the boys did not have sleeping quarters and slept under bridges or in bleak public dormitories. Twice he tried to provide lodgings in his house. The first time they stole the blankets; the second they emptied the hay-loft. He did not give up. In May 1847, he gave shelter to a young boy from Valencia, in one of the three rooms he was renting in the slums of Valdocco, where he was living with his mother. He and "Mamma Margherita" began taking in orphans. The boys sheltered by Don Bosco numbered 36 in 1852, 115 in 1854, 470 in 1860 and 600 in 1861, 800 is the maximum sometime later. Bosco and his oratory moved around town for a number of years; he was turned out of several places in succession. After only two months based in the church of St. Martin, the entire neighborhood expressed its annoyance with the noise coming from the boys at play. A formal complaint was lodged against them with the municipality. Rumors also circulated that the meetings conducted by the priest with his boys were dangerous; their recreation could be turned into a revolution against the government. The group was evicted. In the archives of the Salesian Congregation is a contract of apprenticeship, dated November 1851; another one on stamped paper costing 40 cents, dated February 8, 1852; and others with later dates. These are among the first contracts of apprenticeship to be found in Turin. All of them are signed by the employer, the apprentice, and Don Bosco. In those contracts, Don Bosco touched on many sensitive issues. Some employers customarily made servants and scullery-boys of the apprentices. Don Bosco obliged them to agree to employ the boys only in their acknowledged trade. Employers used to beat the boys. Don Bosco required them to agree that corrections be made only verbally. He cared for their health, and demanded that they are given rest on feast days and that they are given an annual holiday. But in spite of all the efforts and contracts, the situation of the apprentices of the time remained difficult. One influential friend was the Piedmontese Justice Minister Urbano Rattazzi. He was anticlerical in his politics, but he saw some value in Bosco’s work. While Rattazzi was pushing a bill through the Sardinian legislature to suppress religious orders, he advised Bosco on how to get around the law. He found a religious order to keep the oratory going after its founder’s death. Bosco had been thinking about that problem, too, and had been slowly organizing his helpers into a loose "Congregation of St. Francis de Sales". He was also training select older boys for the priesthood. Another supporter of the idea to establish a religious order to carry out Bosco's vision was the reigning pope, Blessed Pius IX. Bosco disliked the ideals that had been exported by revolutionary France, calling Rousseau and Voltaire "two vicious leaders of incredulity." He favoured an ultramontane view of politics that acknowledged the supreme authority of the pope. In 1854, when the Kingdom of Sardinia was about to pass a law suppressing monastic orders and confiscating ecclesiastical properties, Bosco reported a series of dreams about "great funerals at court", referring to politicians or members of the Savoy court. In November 1854, he sent a letter to King Victor Emmanuel II, admonishing him to oppose the confiscation of church property and suppression of the orders, but the King failed to respond. His actions, which had been described by Italian historian Erberto Petoia as having "manifest blackmailing intentions", ended only after the intervention of Prime Minister Camillo Benso, Count of Cavour. The king's family suffered a number of deaths in a short period. From January to May 1855, the king's mother (age 54), wife (32), newborn son (Vittorio Emanuele, Count of Genoa; nearly four months old), and his only brother (32) all died. Opposition to Bosco and his work came from various quarters. Traditionalist clergy accused him of stealing the young and old people away from their own parishes. Nationalist politicians (including some clergy) saw his several hundred young men as a recruiting ground for revolution. The Marquis de Cavour, chief of police in Turin, regarded the open-air catechisms as overtly political and a threat to the State, and was highly suspicious of Bosco's support for the powers of the papacy. Bosco was interrogated on several occasions, but no charges made. Closure may have been prevented by orders from the king that Bosco was not to be disturbed. Several attempts were also made on Bosco's life, including a near-stabbing, bludgeoning and a shooting. Early biographers put this down to the growing influence of the Waldensians in opposition to Catholic clergy. Some of the boys helped by Don Bosco decided to do what he was doing, that is, to work in the service of abandoned boys. And this was the origin of the Salesian Congregation. Among the first members were Michael Rua, John Cagliero (who later became a Cardinal), and John Baptist Francesia. In 1859, Bosco selected the experienced priest Vittorio Alasonatti, 15 seminarians and one high school boy and formed them into the "Society of St. Francis de Sales." This was the nucleus of the Salesians, the religious order that would carry on his work. When the group had their next meeting, they voted on the admission of Joseph Rossi as a lay member, the first Salesian brother. The Salesian Congregation was divided into priests, seminarians and "coadjutors" (the lay brothers). Next, he worked with estarino, Mary Mazzarello and a group of girls in the hill town of Mornese. In 1871, he founded a group of religious sisters to do for girls what the Salesians were doing for boys. They were called the "Daughters of Mary Help of Christians." In 1874, he founded yet another group, the "Salesian Cooperators." These were mostly lay people who would work for young people like the Daughters and the Salesians, but would not join a religious order. The first Salesians departed for Argentina in 1875. After his ordination, Bosco himself would have become a missionary had not his director, Joseph Cafasso, opposed the idea. He nevertheless eagerly read the Italian edition of the Annals of the Propagation of the Faith and used this magazine to illustrate his Cattolico Provveduto (1853) and his Month of May booklets (1858). When Bosco founded the Salesian Society, the thought of the missions still obsessed him, though he completely lacked the financial means at that time. Bosco claimed he had another dream where he was on a vast plain, inhabited by primitive peoples, who spent their time hunting or fighting among themselves or against soldiers in European uniforms. Along came a band of missionaries, but they were all massacred. A second group appeared, which Bosco at once recognized as Salesians. Astonished, he witnessed an unexpected change when the fierce savages laid down their arms and listened to the missionaries. It seems the dream made a great impression on Bosco, because he tried hard to identify the men and the country of the dream – and for three years collected information about different countries. A request from Argentina, turned him towards the Indians of Patagonia, and a study of the people there convinced him that the country and its inhabitants were the ones he had seen in his dream. 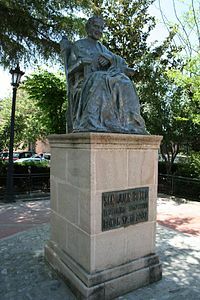 Towards the end of 1874, John Bosco received letters from the Argentine consult at Savona requesting that he accept an Italian parish in Buenos Aires and a school for boys at San Nicolas de los Arroyos. Bosco regarded it as a sign of providence and started to prepare a mission. Adopting a way of evangelization that would not expose his missionaries to wild, "uncivilized" tribes, he proposed setting up bases in safe locations which missionary efforts were to be launched. Negotiations started after Archbishop Aneiros of Buenos Aires had indicated that he would be glad to receive the Salesians. In a ceremony held on 29 January 1875, Bosco was able to convey the great news to the oratory. On 5 February he announced the fact in a circular letter to all Salesians asking volunteers to apply in writing. He proposed that the first missionary departure start in October. There were many volunteers. Bosco died on 31 January 1888. His funeral was attended by thousands. Soon after there was popular demand to have him canonized. The Archdiocese of Turin investigated and witnesses were called to determine if Bosco was worthy to be declared a saint. The Salesians, Daughters and Cooperators gave supportive testimonies. But many remembered Bosco's controversies in the 1870s with Archbishop Gastaldi and some others high in the Church hierarchy thought him a loose cannon and a "wheeler-dealer". In the canonization process, testimony was heard about how he went around Gastaldi to get some of his men ordained and about their lack of academic preparation and ecclesiastical decorum. Political cartoons from the 1860s and later showed him shaking money from the pockets of old ladies or going off to America for the same purpose. These cartoons were not forgotten. Opponents of Bosco, including some cardinals, were in a position to block his canonization. Around 1925, many Salesians feared that they would succeed. Pope Pius XI had known Bosco and pushed the cause forward. Pius XI beatified Bosco on June 2, 1929 and canonized him on Easter Sunday (April 1) of 1934, when he was given the title of "Father and Teacher of Youth". While Bosco had been popularly known as the patron saint of illusionists, on 30 January 2002, Silvio Mantelli petitioned Pope John Paul II to formally declare Bosco the patron of stage magicians. Catholic stage magicians who practice gospel magic venerate Bosco by offering free magic shows to underprivileged children on his feast day. Bosco's work was carried on by his early pupil, collaborator and companion, Michael Rua, who was appointed rector major of the Salesian Society by Pope Leo XIII in 1888. Bosco was the subject of the 1935 biopic Don Bosco directed by Goffredo Alessandrini. He was played by the actor Gian Paolo Rosmino. Bosco was also the subject of a 2004 Italian movie, Saint John Bosco: Mission to Love. The Italian church St. Giovanni Bosco is named after Bosco. The church is located in Montreal, Canada, in the borough of Ville-Emard. 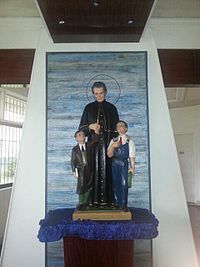 St. Giovanni Bosco is the patron saint of the capital of Brazil, Brasília, which he supposedly foresaw in a prophecy concerning an extraordinary new civilization which would flourish in Central Brazil. ^ Saint of the Day, 31 January: John Bosco SaintPatrickDC.org. Retrieved 2012-03-09. ^ "St. John Bosco | Italian educator". Encyclopedia Britannica. Retrieved 11 March 2018. ^ "ADMA - Association Mary Help of Christians, Torino-Valdocco | 16". www.donbosco-torino.it. Retrieved 27 November 2017. ^ "Salesian Cooperators". Salesians of Don Bosco, Province of Mary Help of Christians, Melbourne. Retrieved 9 March 2012. ^ a b "The Salesian Bulletin in the World". Eircom.net, Dublin. Retrieved 2 May 2010. ^ The Piedmont drought lasted from 1817 to 1819. See The Majesty of Charleston by Peter Beney, p.64, 2005 edition. ^ "Venerable Margaret Occhiena". Salesian Society of Don Bosco. 8 February 1995. Archived from the original on 20 May 2010. Retrieved 17 May 2010. ^ Bosco, John (1976). Memorias del oratorio. Turin. p. 5. ^ "Don Bosco, Friend of the Youth". Salesians of Australia. Archived from the original on 8 June 2010. Retrieved 30 May 2010. ^ Now hosts an exhibition dedicated to the John Bosco. 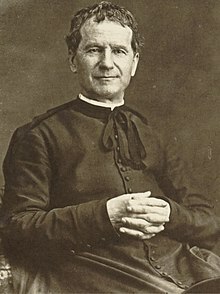 ^ Villefranche, Jacques-Melchior, The Life of Don Bosco: Founder of the Salesian Society, pp. 15–16, Burns & Oates, 18?? ^ a b Mendl, Michael "The Dreams of St. John Bosco", Journal of Salesian Studies 12 (2004), no. 2, pp. 321–348. ^ Petoia, Erberto (June 2007). "I sinistri presagi di Don Giovanni Bosco". Medioevo: 70. ^ "Saint John Bosco". Saints.SQPN.com. 12 August 2010. Retrieved 9 March 2012. ^ Matz, Terry (2000). "St. John Bosco". Catholic Online. Retrieved 9 March 2012. Butler, Alan (1999). Butler's lives of the saints. Tunbridge Wells: Burns & Oates. ISBN 0860122522. Farmer, David Hugh (2004). The Oxford Dictionary of Saints (5 ed.). Oxford: Oxford Univ. Press. ISBN 0198609493. Coulter, Michael L.; Myers, Richard S.; Varacalli, Joseph A. (2012). "Bosco, St. John (1815–1888)". Encyclopedia of Catholic Social Thought, Social Science, and Social Policy Supplement. 3. Scarecrow Press. pp. 36–38. ISBN 0810882663. Morrison, John (1999). The Educational Philosophy of Don Bosco (Indian ed.). Guwahati, India: Don Bosco Publications. ISBN 81-87637-00-5. Bosco, Giovanni (1989). Memoirs of the Oratory. New Rochelle, New York: Don Bosco Publications. ISBN 0-89944-139-4. Desramaut, François (1996). Don Bosco et son Temps. Turin: Società Editrice Internazionale. ISBN 9782906295605. Lenti, Arthur J. Don Bosco: History and Spirit. Rome: Editrice Libreria Ateneo Salesiano. A 7-volume series. Stella, Pietro; Drury, John (1996). 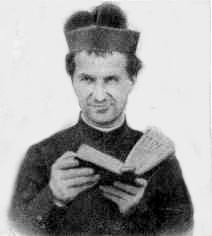 Don Bosco: Religious Outlook and Spirituality. New Rochelle, New York: Salesiana Publishers. ISBN 0-89944-162-9. Wirth, Morand (1982). Don Bosco and the Salesians. New Rochelle, New York: Don Bosco Publications. Translation of id. (1969). Don Bosco e i Salesiani: Centocinquant'anni di storia. Turin: Società Editrice Internazionale.